America’s independence was actually declared by the Continental Congress on July 2, 1776. The Lee Resolution, also known as the resolution of independence, was an act of the Second Continental Congress declaring the United Colonies to be independent of the British Empire. Richard Henry Lee of Virginia first proposed it on June 7, 1776; it was formally approved on July 2, 1776. So what happened on the Fourth? The document justifying the act of Congress – Thomas Jefferson’s Declaration of Independence – was adopted on the fourth, as is indicated on the document itself. So when was it signed? Most delegates signed the document on August 2, when a clean copy was finally produced by Timothy Matlack, assistant to the secretary of Congress. Several did not sign until later. And their names were not released to the public until later still, January 1777. By the time the Declaration of Independence was adopted in July 1776, the Thirteen Colonies (New Hampshire, Massachusetts, Rhode Island, Connecticut, New York, New Jersey, Pennsylvania, Delaware, Maryland, Virginia, North Carolina, South Carolina and Georgia) and Great Britain had been at war for more than a year. That war lasted from April 19, 1775 (with the Battles of Lexington and Concord) to September 3, 1783 (with the signing of the Treaty of Paris.) It lasted 8 years, 4 months, 2 weeks and 1 day; then, the sovereignty of the United States was recognized over the territory bounded roughly by what is now Canada to the north, Florida to the south, and the Mississippi River to the west. At the time of the American Revolutionary War, the Hawaiian Islands were divided into four kingdoms: (1) the island of Hawaiʻi under the rule of Kalaniʻōpuʻu, who also had possession of the Hāna district of east Maui; (2) Maui (except the Hāna district,) Molokaʻi, Lānaʻi and Kahoʻolawe, ruled by Kahekili; (3) Oʻahu, under the rule of Kahahana; and (4) Kauaʻi and Niʻihau, Kamakahelei was ruler. 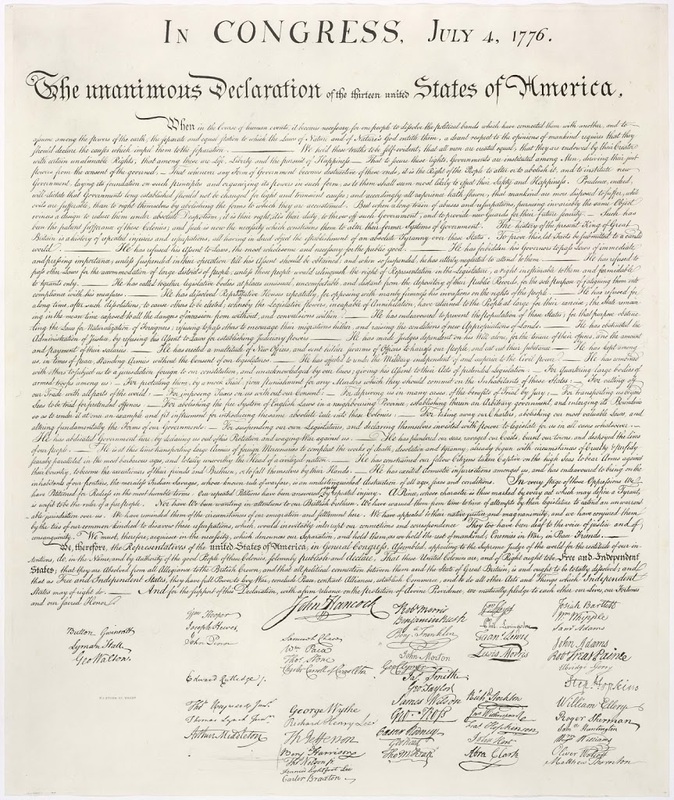 The image shows the signed Declaration of Independence.